Manufacturer: Sterling Handling Equipment, Inc. Description: Special flat-bed style model BB 104 handles brick, block, tile and similar materials. Bed 23 1/4" x 25" with 20 degree forward slope. Adjustable 18 - inch high dash. Heavy 3/4" select hardwood sanded and finished in Sterling Red with oil base high-gloss enamel. 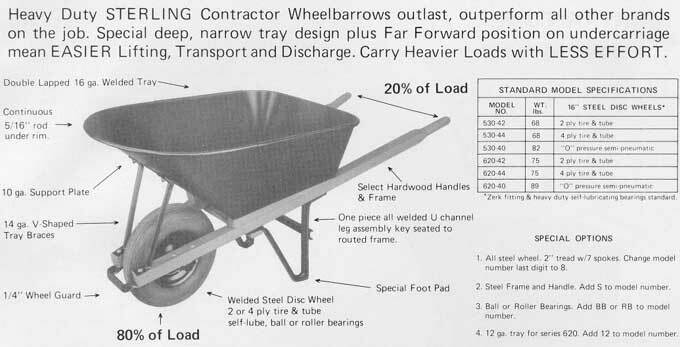 Same wheel and bearing choices as Heavy Duty Contractor Wheel barrows. Description: Heavy Duty Sterling Contractor Wheelbarrow outlast, outperforms all other brands on the job. Special deep, narrow tray design plus Far Forward position on undercarriage mean EASIER Lifting, Transport and Discharge. Carry Heavier Loads with LESS EFFORT. Description: Wheelbarrow Trays and Mixing Box offer a ligther weight, no-rust alternative to steel with rotationally molded linear polyethylene for durability and long inservice life. Wheelbarrow models 51P and 65P have Standard Sterling Features such as: one piece all welded leg assembly key seated to routed hardwood frame; far forward tray position; pouring chite support plate; V shaped diagonal tray braces. 2 or 4 ply tire and tube. Heaped capacities 5 and 6.5 cu. ft.
Mixing Box model MB-9P weighs only 24 pounds. 58" x 30" top dimension slopes to 37" x 27" bottom. 11" depth. Level capacity 9 cu. ft.